The idea of a pre-existent Messiah is not completely unknown to Judaism. In fact, I lightly touched on this idea in my previous blog post on Breishit, where I connected this idea to Creation, and further to John, chapter 1. The book of John is traditionally attributed to the apostle John, one of the original twelve shlichim of Yeshua, and believed to be written between 60-100 CE. Many scholars believe that one of the main emphases of the book is to defend Yeshua’s deity. Rather than a history of Yeshua, it is primarily a profound study of who Yeshua is. It is deeply mystical, and filled with rich spirituality and symbolism. When reading the beginning of John, one should be immediately hit by the imagery of Creation. This is no accident, for there is a direct and purposeful connection between Genesis 1 and John 1. John purposefully uses words and imagery from the Creation Account to equate the G-d of Creation with Yeshua. For John, since Yeshua was at the Beginning (John 1:1), and only G-d was existent at Creation (Genesis 1:1) John is contending they are one and the same! John wants the message to be bold and clear – Yeshua the Messiah is the G-d of Creation. and the Word was with G-d, and the Word was G-d. He was with G-d in the beginning. For those steeped in Jewish thought, the Jewish context of John is clear. John is writing with Genesis in mind. As such, for many of us, the idea of the Torah made flesh – that Yeshua himself is the Torah incarnate – is not a problem. However, the question may still arise as to the idea of incarnation within a modern Jewish context. One can argue that maybe during the Second Temple period there may have been a few Jews that believed in a divine Messiah, and in some sort of concept of incarnation. But is there a more recent parallel in Jewish texts? The answer is yes! 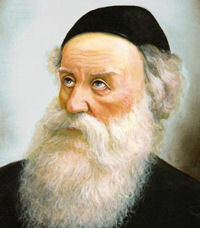 Around 1797, the Alter Rebbe, Rabbi Schneur Zalman of Liadi (the founder of Chabad Chassidus) composed the Tanya – which quickly became one of the primary texts of the Chassidic movement. In a particular passage of the Tanya, the Alter Rebbe explores an idea of the Torah and HaShem being one and the same. According to the Tanya, the Torah itself is a type of physical incarnation of G-d. Although this is not an exact parallel to John 1, what it does help us understand is that the idea of incarnation and specifically the idea of “Torah made flesh” are intrinsically Jewish. The Alter Rebbe spends an entire chapter in the Tanya describing this mystical relationship between HaShem and the Torah. This entry was posted in Uncategorized and tagged Apologetics, Deity, mashiach, Messiah, Messianism, mysticism, New Testament, torah, What Your Rabbi Hasn't Told You, Yeshua. Bookmark the permalink.